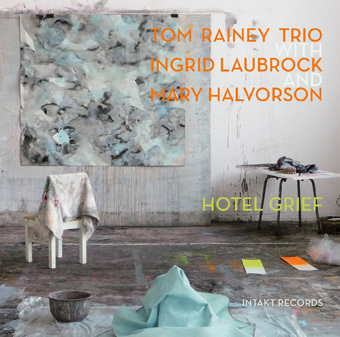 “Hotel Grief,” the latest from the Tom Rainey Trio (Rainey on drums, Ingrid Laubrock on saxophones, and Mary Halvorson on guitar), is a live recording from December 30, 2013. For a few reasons, mostly the lack of online chatter, this group seems underappreciated. Yet, the trio consistently churns out dynamic, sensitive improvisation. Tom Rainey, leader of this group, has a resume about a mile long, and surely most readers of this blog are familiar with his work with Tim Berne, Tony Malaby, and Mark Helias, as well as his recent recordings with Kris Davis and Ingrid Laubrock. He’s been a regular fixture for decades, but this stretch of trio albums released in the past few years have demonstrated the emotion in his performance. Rainey’s collaborative style brings a good deal of surprise to the whole, as he leaves himself open to the river of ideas flowing from Halvorson and Laubrock. My music library is rapidly filling up with albums led by or featuring Mary Halvorson. This isn’t a complaint, just pointing out the degree to which her sound has come to signify the 2010s. Her waves of sound, accented by effects pedals, complement Rainey’s fluid drumming. Despite the recognizable touchstones of her style, one of the more impressive aspects of Halvorson’s playing is how she gives herself over to the feel of whatever recording she’s on. She’s been on an incredible range of ensemble records this year (Laubrock’s Anti-House, Tomas Fujiwara’s Hook Up, Jacob Garchik’s Ye Olde, Tomeka Reid’s quartet), and it’s interesting to hear how she slightly augments her very distinct sound to adapt to the group dynamics. And then there’s Ingrid Laubrock. To me, she’s the standout of the recording. I can’t be the only one consistently surprised by her imaginative improvisation, which marries a rich tone with clipped, languid phrasing. The key, though, is Laubrock’s fierce and fiery approach. She’s developing a unique voice on the saxophone and pushing herself to expand her vocabulary with a passionate dedication to the art of improvisation. While it’s not impossible to hear the roots of her style in her earliest records, I feel like I’m listening to a completely different person from the one who recorded those first albums with the F-IRE Collective. Recorded live, there’s a nice shape to the trio’s performance. The opener, “Last Overture,” gives each member a chance to introduce themselves through an early solo turn. Halvorson opens the song in a textural mood, and her solo is a lovely wash of chords. Rainey’s solo, when it comes around 5 minutes in, is big and bold, somewhat atypical of his signature light touch. Later, when he and Halvorson break into a rock groove, the beat feels oddly metered, and their interplay with Laubrock gives the whole moment a kind of Berne-ian feel. Halvorson layers distortion and pedal-tinged riffs, while Rainey gradually pulls at the threads of the beat, moving all around the drum set. Finally, Rainey and Laubrock fall away, and “Last Overture” ends in a moment of sustained guitar. There’s a brief pause before “Hotel Grief,” which is a stunning achievement, the high point of the album. Halvorson tweaks the volume knob so her guitar melts in and out of the background. Rainey plays what I’m keen to call melancholy drums. I don’t quite know how he achieves this, but his interplay with the trio is emotionally complex. It’s a passionate, languid improvisation, one of two tracks stretching nearly 20 minutes. The second, “Proud Achievements In Botany,” opens with a searching sax and gentle background fills from Rainey. A few minutes in, Halvorson and Rainey create an eerie mix of effects that gently lead into Laubrock playing a low, patterned line. Gradually, the three transition into an extended minimalist improvisation that quickly ratchets up the tension, maintaining it for minutes on end. It’s an fine example of the power and range of this trio.